Children have their own development rate and need lots of time to learn new things. Simply offer your child dishes with chunks in them again and again. Some children like to bite off chunks from a bigger piece – try whether your child prefers to nibble on a banana or a piece of soft bread. My child keeps putting their hands in food – what should I do? 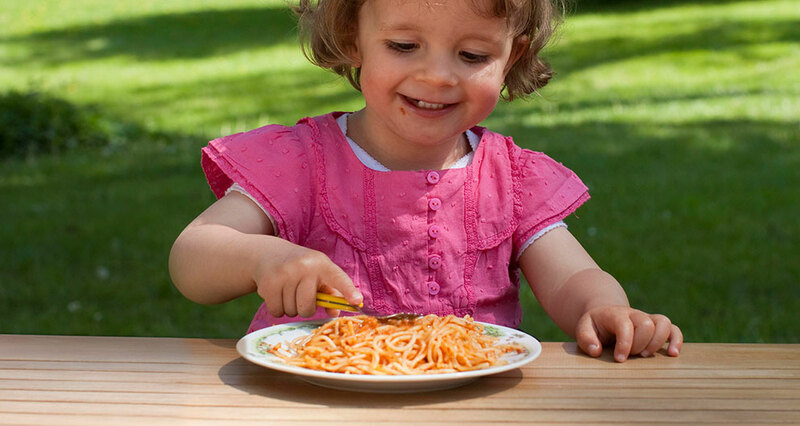 Your child explores its food with all senses; that is alright at this age. Touching and trying is allowed, just make sure enough gets into the mouth! This phase will pass. My child plays around with their food and doesn’t eat. What can I do? There are different reasons why your child is behaving like this. Take the time to spend time with your child and find out what the reason is. Maybe your child is simply not hungry – then it is better to end the meal. Does your child want attention? Then eat with your child, feed her or him for a while and then encourage them to eat something by themselves again. Do you have your own idea?